Links to the latest "stuff" updates can be found at the bottom of the XMPlay webpage (under "Latest stuff"). 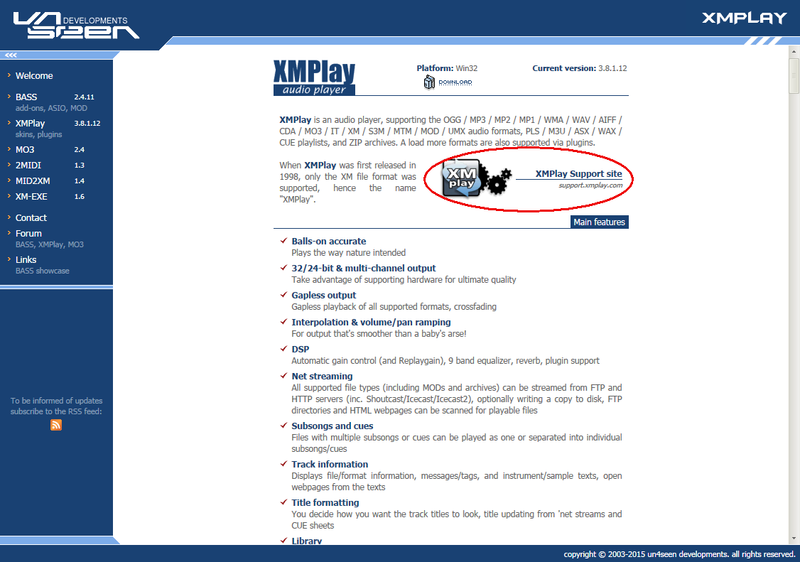 I meant hosted on the support.xmplay.com site, as it is the only site unblocked at school. When I try to access it there, it says it is blocked because it is listed as . You could take your personal copy to school with you so that you don't have to download it every time. Or think of a good reason and ask the administrators to unblock un4seen.com. You could take your personal copy to school with you so that you don't have to download it every time. I have a personal copy with all my plugins and encoders. I found out about UnderGet. Don't let the man keep you down. Can someone check and/or confirm this? Seems like the suppoort site is displaying with no style, just like when pages have yet to load the css... Can someone check and/or confirm this? The CSS seems to be loaded, but the desktop version now looks like the mobile site (everything in a single column). I guess there's something wrong indeed. Indeed, everything is back to normal again . Nice, it's fixed now, thanks. I think this very effective and most useful forum is an essential support asset. It should <IMHO> be findable in an easier way e.g. bigger letters and prominent placement right at the top or in the side-bars. In fact I only found it as a link in one of the texts I had been browsing. Would somewhere like there be good? No need for all the sarcasm, as far as I understand (and within the context of this thread the assumption makes sense), Nick was unaware of this forum because it's not directly linked on the support site. It would indeed make sense to put a forum link in the menu bar there. The OpenMPT input plugin on the support page is terribly outdated, would be nice to link to the latest version instead. Yep, the latest version of the OpenMPT plugin (0.2.6401) has been put up on the support site now. Can you please update the libopenmpt package once again? If you add a VERSIONINFO resource to the plugin, it could also be added to XMPlay's built-in update notification system. I'll look into that for the next version.